It’s the end of a long weekend and all my fellow MELD members think I’ve been applying myself to some exhibition pieces. NOT! I spend the first two days totally absorbed in the detective problem solving that is on-line genealogy research. Love it , but it doesn’t get things made. Was going to apply myself today, honest! But I thought I’d just better spend a bit of time in the horrible overgrown courtyard so the brown lidded bin has something in it for collection tomorrow. Well, perhaps it was a necessary time investment….. and perhaps it was a displacement activity. Goodness knows, I’d been keeping the curtains closed when expecting visitors so the tidy up was well overdue. I’m about to fire up the free motion quilting (although the ABC news will be on soon….) but thought I’d post a peace offering to the group: This is a couple of the elements of a new vessel I’m trying to construct. It involves some fairly complicated piecing (my fault, got carried away with the curved drawings) and some VERY stiff interfacing, which perhaps accounts for my disinclination to work on it over this weekend! 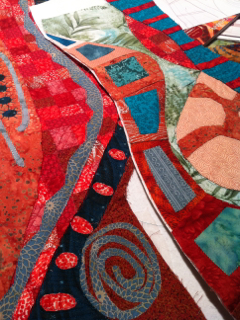 This entry was posted in Design, fabric collage, Machine quilting, patchwork. Bookmark the permalink. Sounds good and looks good to me. I’ll have to be very creative but keep things simple when I get home to achieve things for exhibition! A rather scarery thought at the moment! You’ll have no problem Julie! You already have the plans for some gorgeous work! Between us, we’ll have a great feast for the art cognoscenti! It has been such a lovely winter day today, the best choice was the garden. Anyway, there are all the hours you would normally waste sleeping to work on the exhibition! Thanks Liz, so encouraging! And I did stitch until 2 this morning , mindful of Louise’s comment!